1) The personal/leadership level: with an emphasis on developing those essential skills and attitudes that allows young professionals to effectively engage into diverse cultures, complex political and social situations. 2) The organizational / managerial level: with a support for enhancing organizational capacity to become self-sustained economically and in their ability plan, produce, assess and replicate sustainable outcomes. 3) The institutional / systemic level: with a special assistance at providing the necessary legal frameworks for the promotion of human rights, labor rights, environmental rights and anti-corruption. 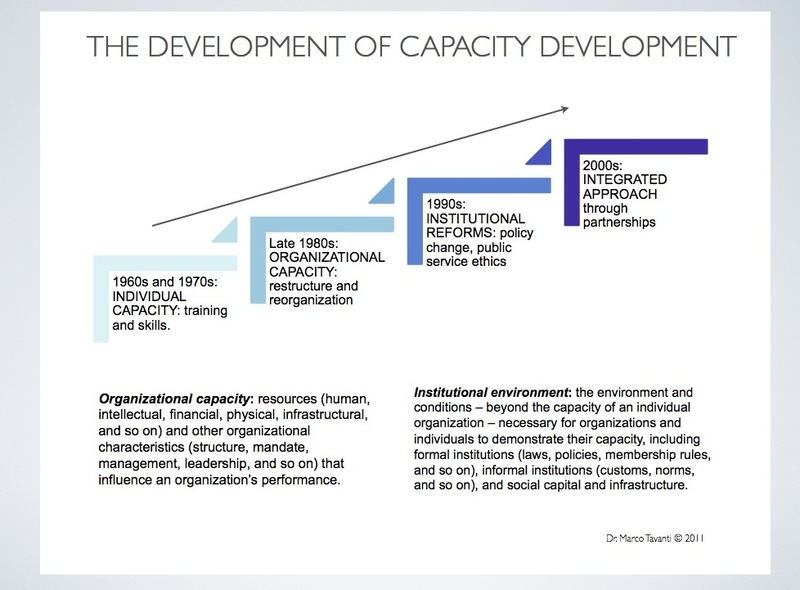 There is an international consensus around capacity development: It recognizes the need to develop existing capacity rather than build from an imaginary scratch. A second important shift lies in the recognition that capacity development needs to consider the individuals within their context and that this context is multi-leveled: an organization, an institution and indeed a country with its traditions, its power relations and its history. There is a general consensus on the interrelated but distinct definition between competencies (interpreted more as individual attributes), capabilities (recognized as collective ones) and capacity (the combined individual competencies, collective capabilities that enables human systems to create values). The United Nations Development Programme (UNDP) recognizes capacity development as a process that “starts from the principle that people are best empowered to realize their full potential when the means of development are sustainable – home-grown, long-term, and generated and managed collectively by those who stand to benefit”(Capacity Development, a UNDP Primer). The approaches in adopting capacity in development has been evolving and developing over time toward a more integrated and sustainable model. 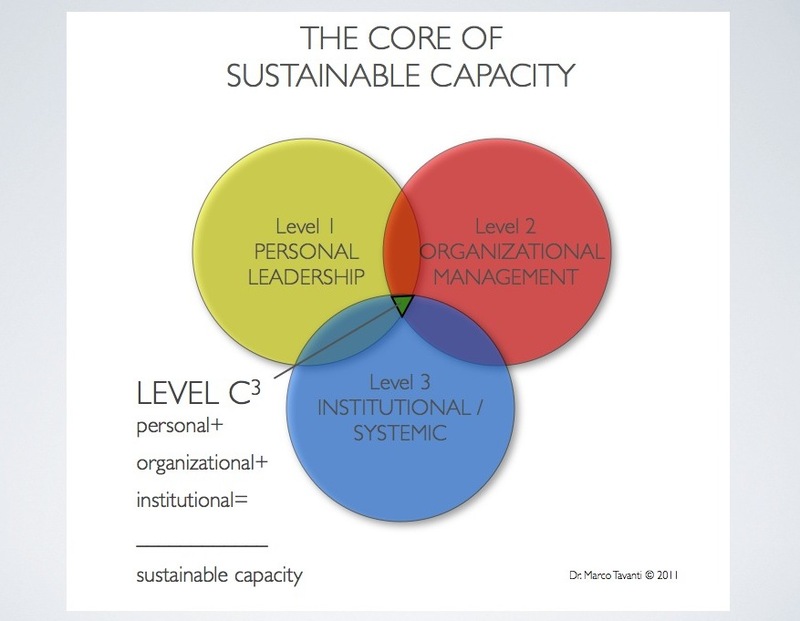 The institutional framework has been always recognized as being central for achieving a sustainable future. Yet, many still think that a fragmented and not institutionalized approach would generate a economically viable, socially inclusive and environmental bearable future. Since the 1992 Rio Earth Summit the Agenda 21, has played a vital role to make concrete steps toward sustainable capacity development. The institutional capacity of a country is vital to the promotion, protection and participation into a sustainable economic, societal and environmental development. Along financial capital, social capital and natural capital, the institutional capital is the glue that holds together the sustainable future we want. It is manifested in the governance, rule of law, international engagement capacity. It emphasizes the importance of the normative and rule-making aspects of development. 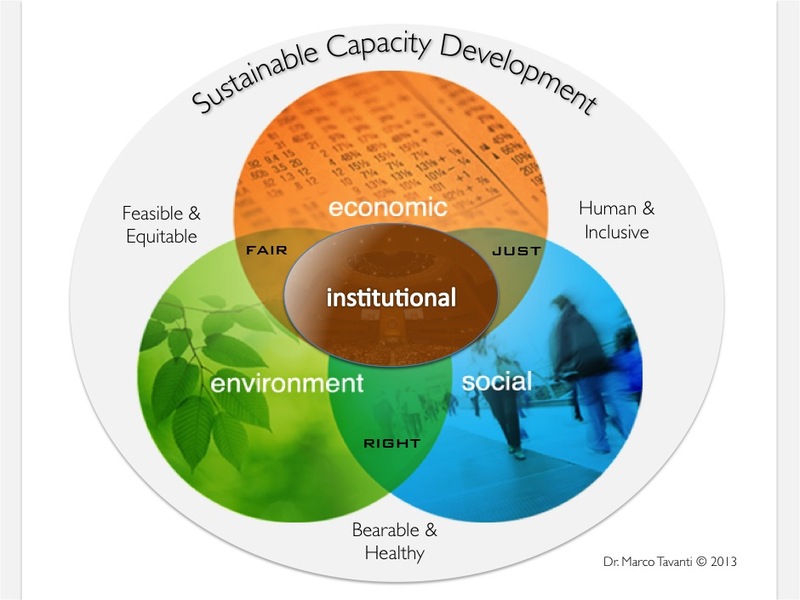 Twenty years later, the concept of three mutually reinforcing pillars of sustainable development needs to be recognized and incorporated into the Institutional Framework for Sustainable Development (IFSD). The role of local, state, national, regional and international institutions will highly influence the policies and practices integrated with sustainable development. 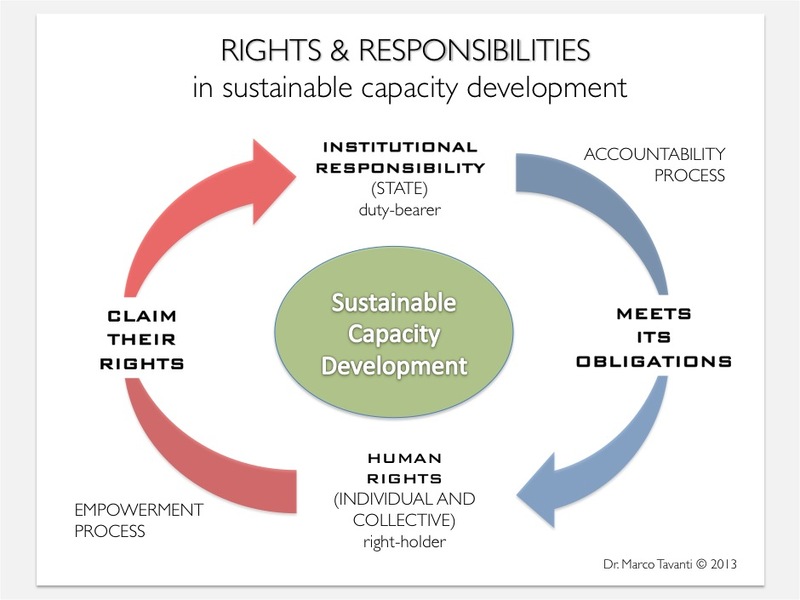 The SCII approach for achieving sustainable capacity in people, organizations and institutions in development / transition passes through human rights. Hence it enhances the the institutional / systemic capacity, responsibility and sustainability of a right-based approach to development. Hence the SCII approach is a human rights-based sustainable development model centered on academic institutions and supported by cooperation and partnerships across public, private and nonprofit sectors. Dr. Marco Tavanti and Dr. Sfeir Younis have argued for the need of an integrated approach to sustainable capacity development - on that is based on human rights and institutional responsibilities. The 1997 UNESCO Declaration on the Responsibilities of the Present Generation Towards the Future Generation integrates rights with responsibilities in the context of sustainable development and ‘intergenerational solidarity.’ Article 1 of the declaration states that "the present generations have the responsibility of ensuring that the needs and interests of present and future generations are fully safeguarded." The rights and responsibilities toward future generations are at the core of the very notion of sustainable development as “development that meets the needs of the present without compromising the ability of future generations to meet their own needs.” (UNESCO Declaration on the Responsibilities of the Present Generations). A rights-based typical intervention focuses on increasing the capacity of the rights-holders to claim their rights as well as increasing the capacity of the duty bearers to fulfill the rights of the rights-holders. The focus on rights is ultimately a contribution to increasing the institutional and people-centered sustainability. Through this approach the human rights and institutional responsibilities are seen as part of the same equation for empowerment, accountability and, ultimately, capacity development. This is at the core of the human rights based approach to development. This human rights based approach to sustainable development (HR2SD) expands on the human rights-based approach to development (HRBA) by integrating and centering the notion of human rights and human development with the economic, social, environmental pillars of sustainability. The Sustainable Capacity International Institute (SCII or SCIInstitute) is a European based international non-governmental organization registered in Italy as a nonprofit organization for social benefit (ONLUS). SCIInstitute provides capacity development services for sustainable international development in transitional and post-conflict countries.